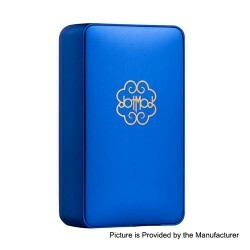 The Original Dotmod Dotbox Dual Mech is a dual battery mechanical box mod device designed for the advanced vaper. Utilizing either a series or parallel battery orientation, dictated by the switch underneath the magnetic removable side panel, the Dotbox Dual Mech allows for vapers to choose between a long-lasting parallel setup, or a super powerful series setup. The mod is powered by dual 18650 batteries (NOT INCLUDED). The full anodized aluminum body holds a sleek and minimalist exterior, showcasing the staple reflective Dotmod logo on one side, and the gold-plated and engraved firing button and gold plated 510 connection. The Dotbox Dual Mech is a fantastic box mod for the advanced vaper looking for a beautifully crafted masterpiece of design work as their next device. This item also has other colors to choose.